Isn’t that Rachel and E-merl IRL? (1) one bronzed internets for you! (2) I’m SO jazzed to see what happens this Axemas! Seeing Rachel’s avatar warms my heart. What if the man is Rachel and she is E-Merl? Archives: chapter 33, page 14. I dunno that first send up of Doctor Zeus with Bandit is gonna be tuff to follow. I say bring it on and merry solstice PeganJudaoChristian mid winter shopping holiday to all and to all a good nite. 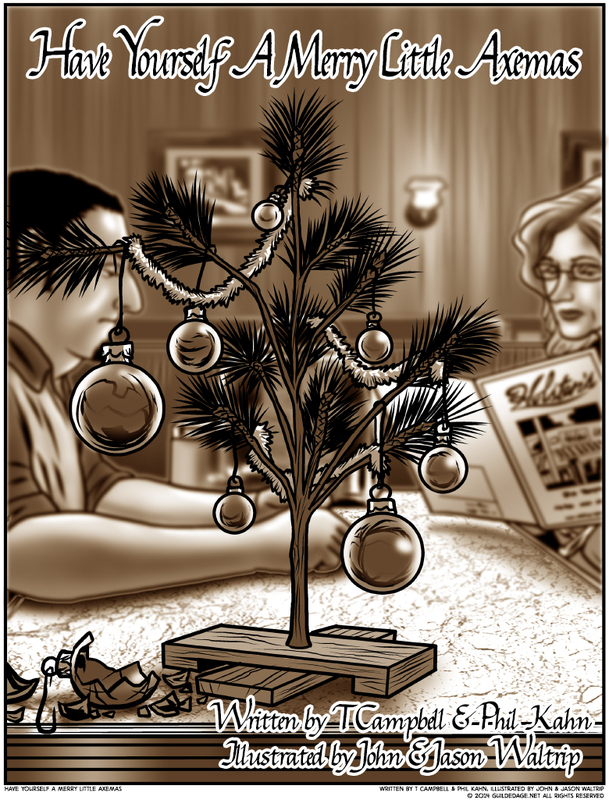 Charlie Brown Christmas Tree! Hooray. That’s the only decorating I do for the holidays anymore. Where did that ornament fall from? I am inordinately bothered by this. Perhaps they broke it themselves, intentionally. Maybe it’s like that Greek thing with the breaking of the plates and the loud noise and the yelling and the what have you. The tree looks young, as if it hasn’t entered puberty. So its balls have yet to completely drop. It seems they change automatically if you don´t write a comment for a few weeks. Someone’s parents wondering why their kid hasn’t checked in for the holidays? Wow. I was hoping that one of the next few regular chapters (as opposed to e.g. Axemas specials) would let us meet Rachel’s player, but I did not expect it this soon.